STOUGHTON, Mass. – The home team just would not go away. 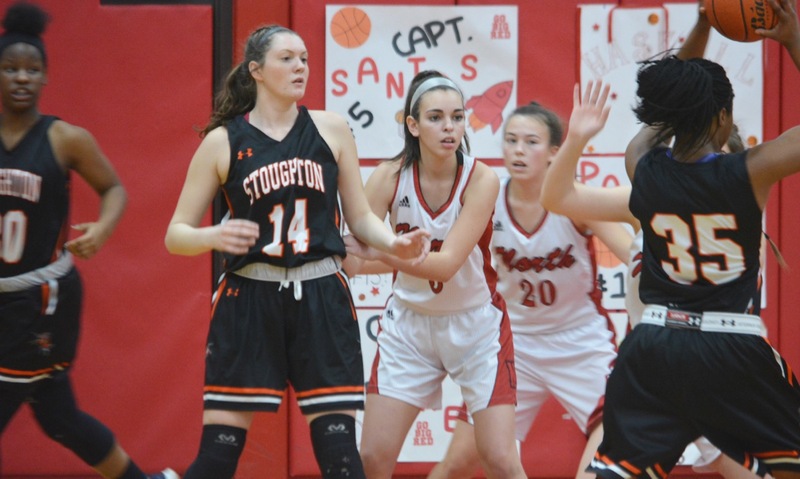 Despite trailing by double digits in the fourth quarter against Davenport division-leading North Attleboro, which came in with only one loss on the season, Stoughton continued to fight and twice cut the lead to as little as six points. There was no panic on the North bench. 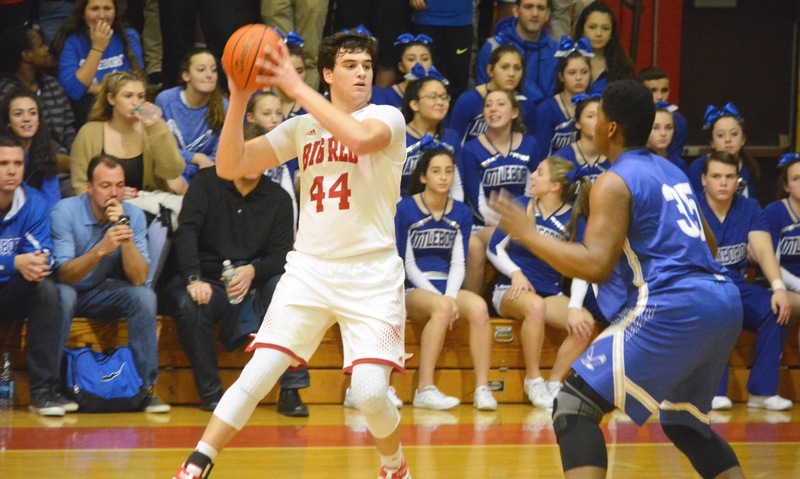 With four seniors in the starting lineup and eight players returning from last season’s trip to the state title, the Rocketeers have plenty of experience in close games on the road. 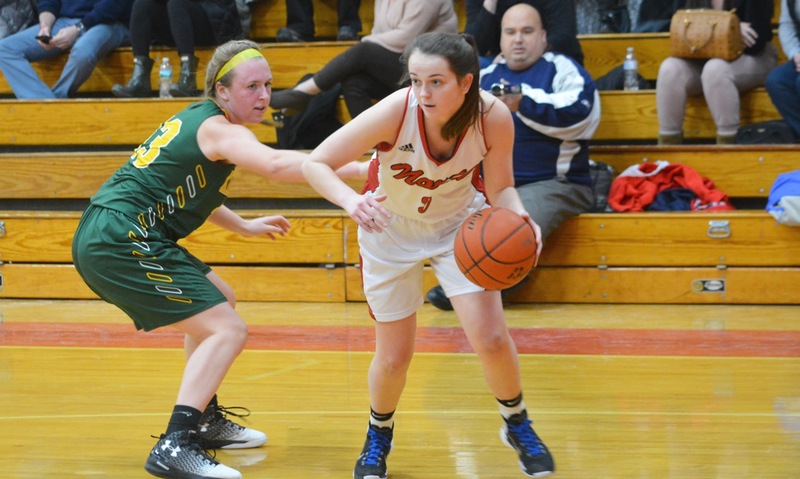 Senior Ashley Ahern scored five of her team-high 17 points and dished out an assist for a Julia Feid three, as North went on a 10-0 run to put the game away late. 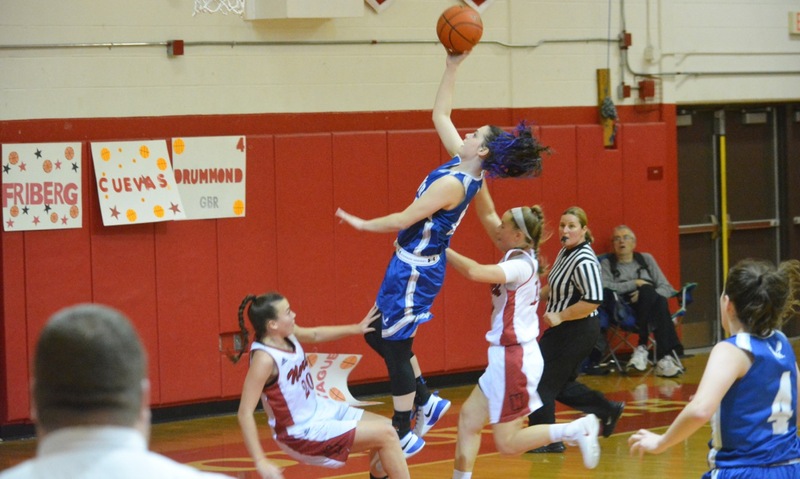 The Rocketeers continued their unbeaten start to the league campaign with a 59-47 and extended their lead in the division to 1-1/2 games over Milford and Foxboro. 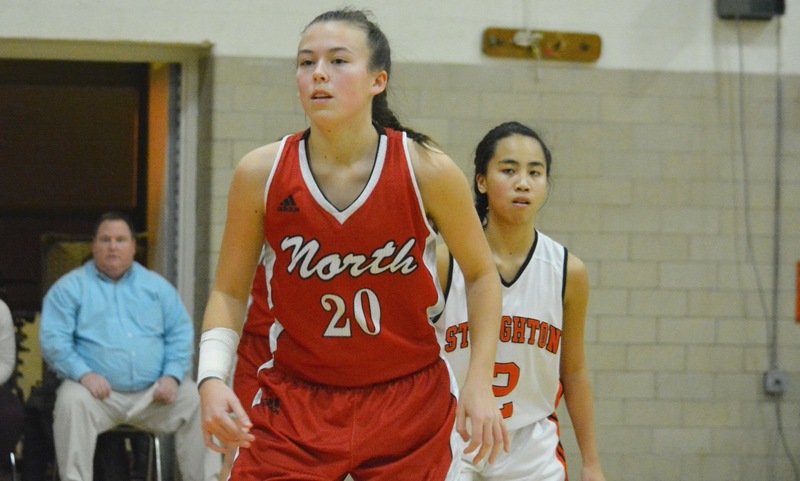 North led 43-34 heading into the fourth quarter, but after Feid knocked down a pair of free throws to put the Rocketeers ahead by double digits freshman Shyanne Trinh (six points) drilled a three off a Val Whalen assist. On the next possession, Lili Njiem, Stoughton’s lone senior in the regular rotation, snagged an offensive rebound (her 12th rebound of the game) and laid it in to cut the lead to six. Caroline Collard (12 points, 10 rebounds) hit a pair from the line, but freshman Aliyah Wright (11 points, nine rebounds) answered right back for the Black Knights with a drive to the basket. After a turnover, Jordan Motley (19 rebounds) had a chance to cut it to four, but her free throws would not fall. North got the rebound and took control. Samantha Taggart hit Collard on a roll to the basket for a layup, then Ahern drew the defense and kicked out to Feid for a three in front of the North bench. Julia Santos kicked out to Ahern for a deep three and then she added a pair from the line to push the advantage back to 16. There was plenty for the Stoughton coach to be proud of on Friday night. The Black Knights played with intensity from the opening tip, dominated on the glass, and kept the Rocketeers off-balance on the offensive end of the floor. North jumped out to a lead in the first quarter, showing off the team’s depth. 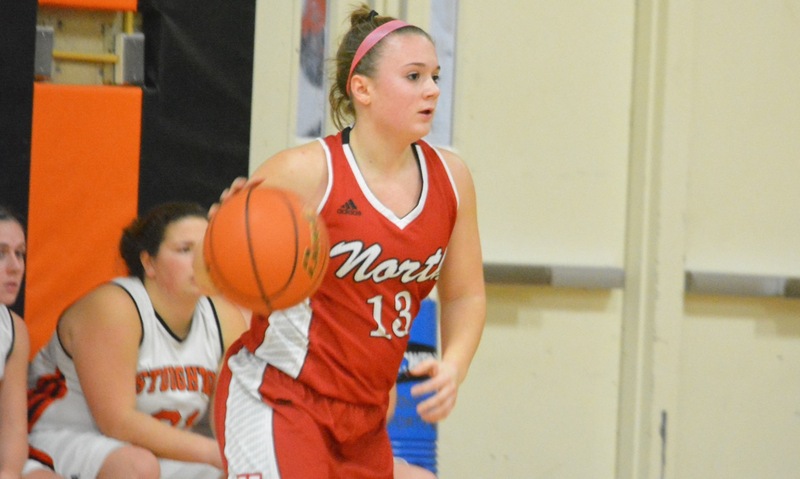 The Rocketeers would have eight players on the scoresheet in the game, including junior Emily Haskell, who scored all four of her points in the first to help out North ahead 14-8. Trinh hit a three at the buzzer to cut the lead in half going to the second. Thanks to four points apiece from Ahern and Collard and contributions off the bench from Santos and senior Liz Morehouse (six points), North extended the lead to 10 by halftime. Stoughton hung around in the third and kept the deficit to single digits thanks largely to the play of Whalen. The junior forward put in a monster performance, pulling down 23 rebounds on the night and scoring 15 of her game-high 20 points after the break, including nine in the third quarter alone. Njiem added a three in the third and Wright had four points in the quarter, but North kept a solid lead thanks to its seniors. Ahern had five, Collard had four and Morehouse and Emily Schromm each had three in the period. Stoughton never backed down, but in the end North made the plays to come out with the win. Herber explained, “We knew going in that it was going to be one of those games. We play the same style of basketball they do, slow it down, make it a little ugly, play good defense, rebound and get opportunistic offense. 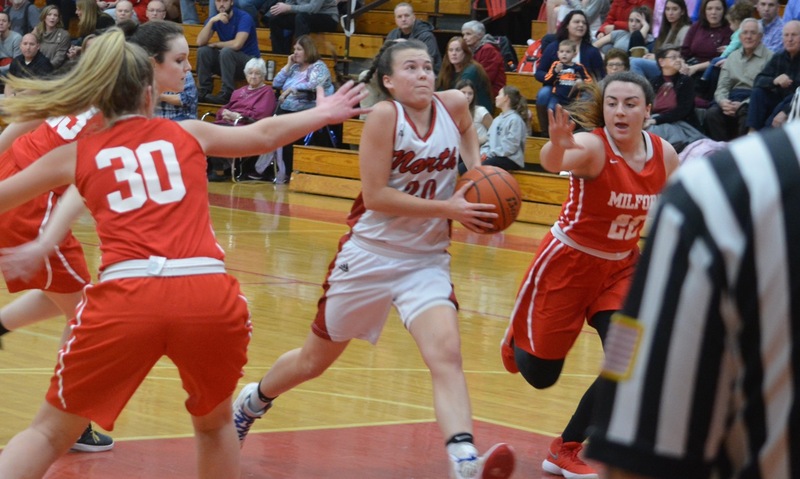 North Attleboro (8-1) travels to Cranston East on Saturday and then will take on the two teams tied for second in the Davenport, starting with Milford on Tuesday. Stoughton (1-7) will look for its first league win of the season on Tuesday against Sharon.